Can Robotics Support Mental Health Outcomes? Next week I have to present an academic poster on my research so far. 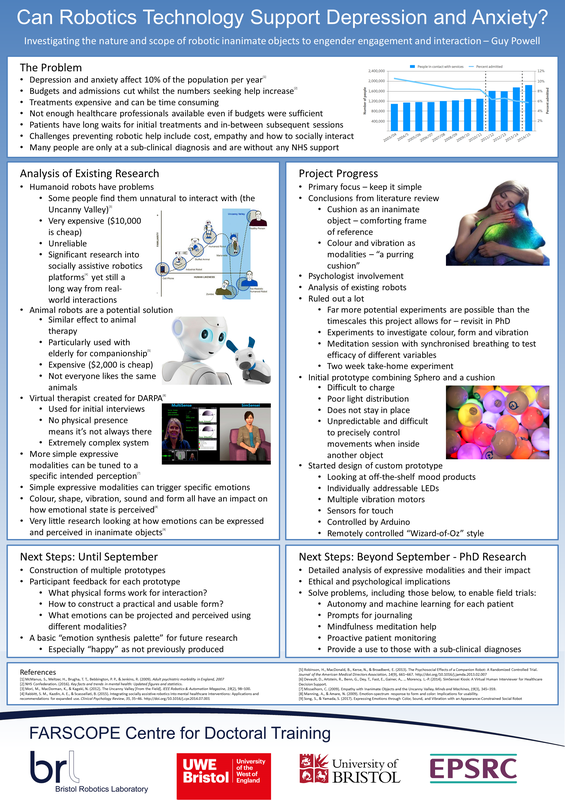 I am investigating how completely inanimate objects can be animated in such a way with robotics that they can be ultimately used to express emotion and help those suffering with anxiety and depression. Rather than writing up a normal blog post I’ve recorded a video describing my research and present my poster here. In the past the content I’ve written on robotics hasn’t received much interest despite the length of time some of it takes to prepare but I wanted to give it one more try since this is looking specifically at my research rather than that of others in the field. If you’re interested in finding out more than is on the poster below please check out the video for much more information and do let me know. I co-founded a startup to help more objectively diagnose mental health disorders using neural network analysis. The idea is to correlate emotional recognition to a series of standardized therapy responses. Eventually, we would like to be able to predict mental health outcomes based upon microexpressions. If you are interested in this topic, I’d really like to discuss and brainstorm ideas with you. Please feel free to reach out. Cheers, Drew.